I’m fairly certain Opie either sends commands to me telepathically or he’s just really good at making me feel guilty. Either way, Opie successfully made the Catalina stay all about him. 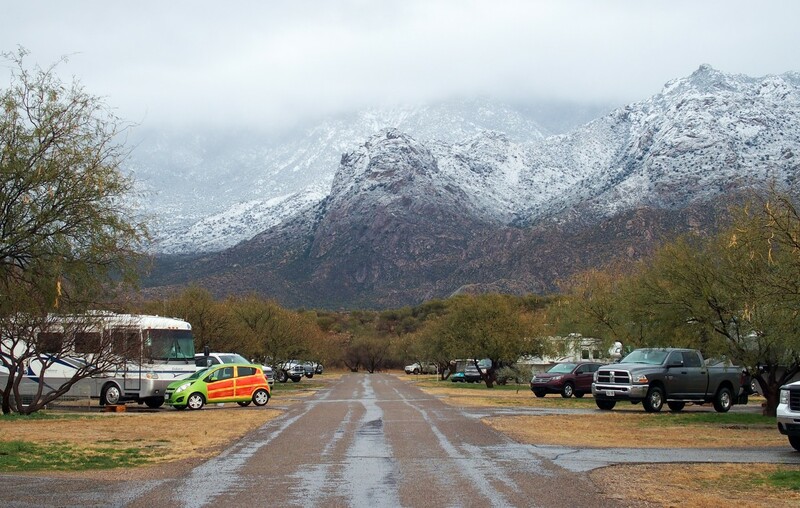 Rain for us meant snow in the Catalina mountains. Last year we spent a lot of time in Tucson sight-seeing which is a far cry from our stay this year. Honestly after our record-breaking drives to get to AZ, the snow, and the cold, we just wanted to soak in the AZ sun and thaw out. We do have friends in Tucson so we spent a lot of time hanging out with them (and their internet and laundry machines). It’s great since they have the same taste in games as us, so we played a lot of silly cards games like Munchkin, Exploding Kittens, and Ninja Burger. Meeting new friends on the road is a lot of fun, but hanging out with friends we’ve known for almost 20 years is priceless. 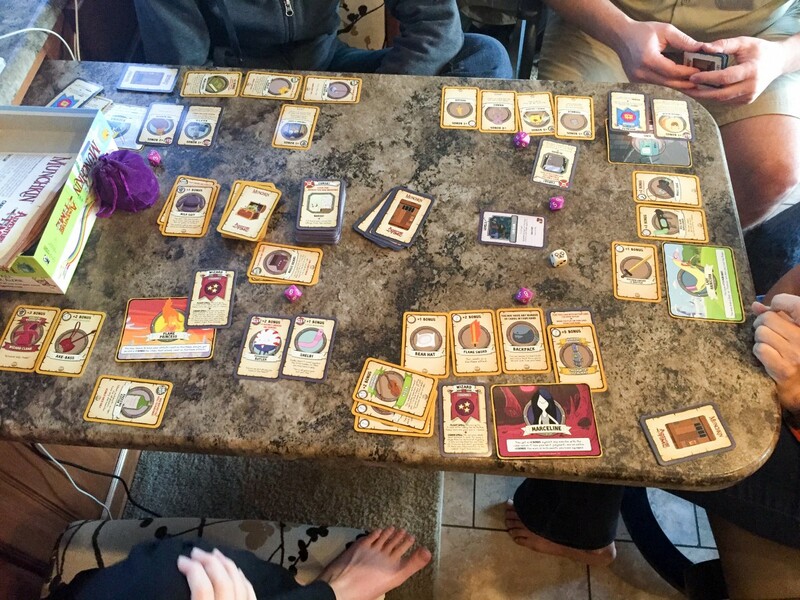 A friendly game of Munchkin with friends. 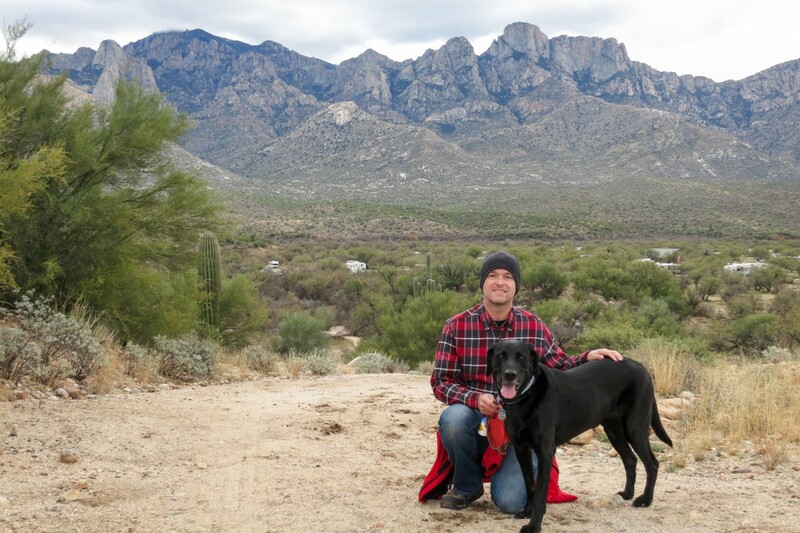 When we weren’t socializing, we spent a lot of time hiking/strolling/ambling through Catalina State Park. 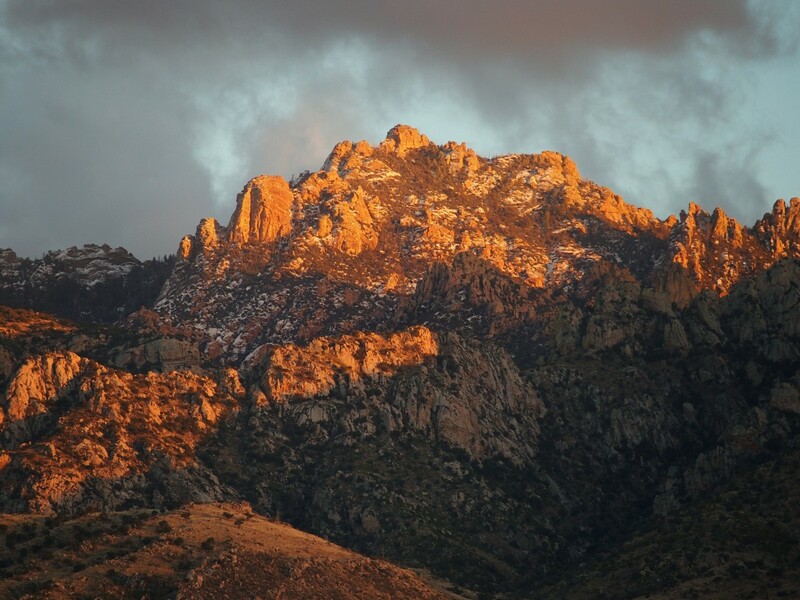 The park borders the Bighorn Sheep Management Area/Coronado National Forest. 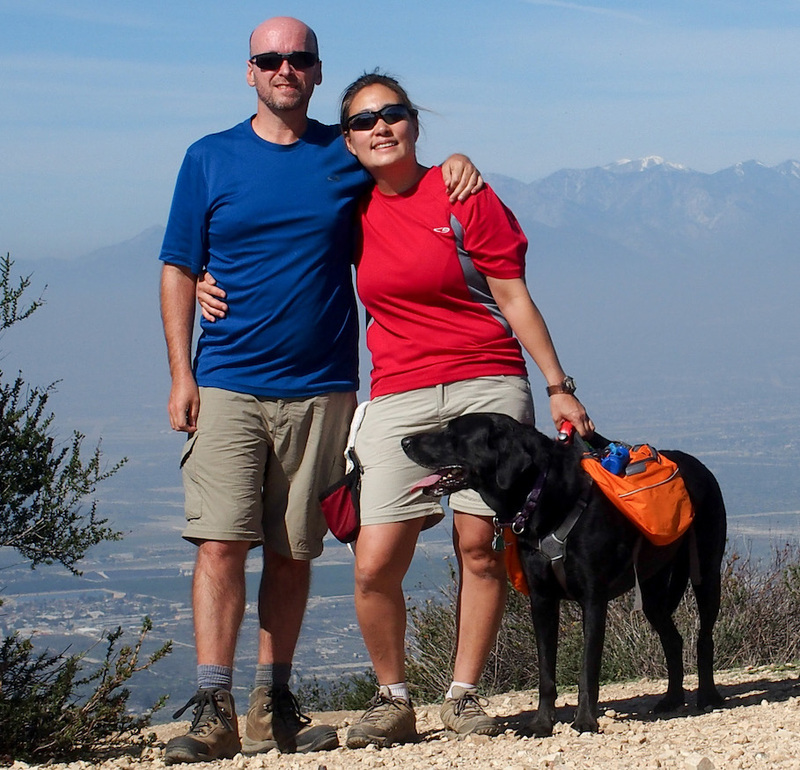 Since they are trying to reintroduce Bighorn Sheep, dogs are not allowed on those hiking trails. However there are a lot of other great hiking areas within Catalina SP. I know the little stinker knew it too so when I wasn’t busy, I’d see Opie sitting very still watching me intently while projecting thoughts of hiking into my brain. Opie loves a nice hike. Due to the cooler weather the prairie dogs stayed indoors but that didn’t stop Opie from trying to entice them out. 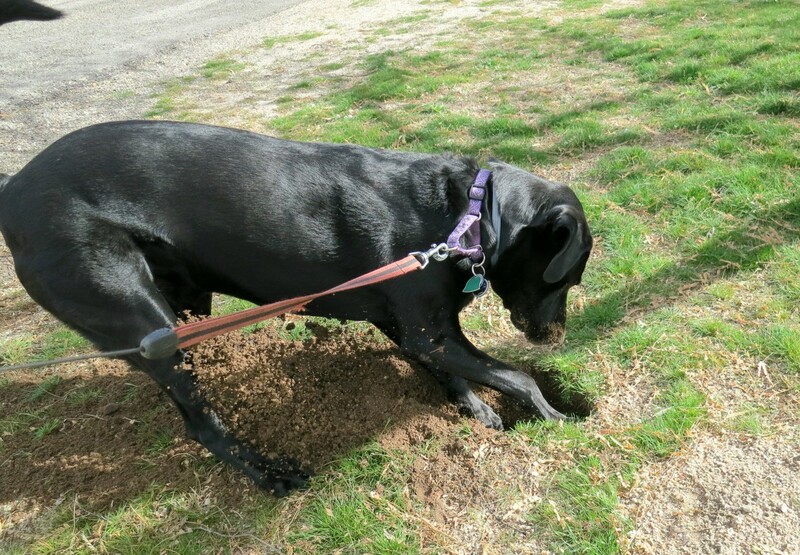 He’d check out all the holes and even tried to help renovate and expand the entrance to one of them. You don’t mind if I invite myself in, do you? 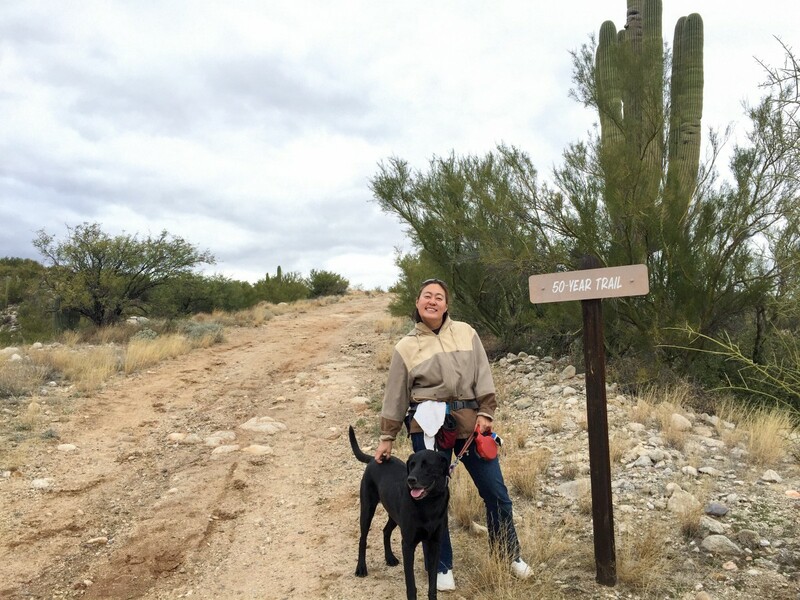 Opie and I really enjoyed strolling Canyon Loop Trail, a relatively flat easy hike through the foothills. 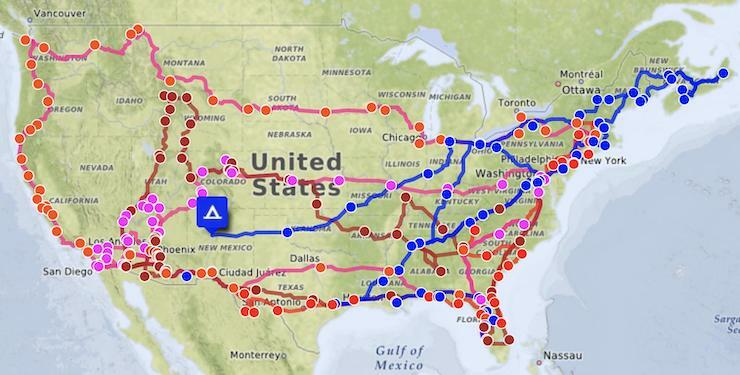 It’s an easy 4 miles roundtrip from the campground (the trail itself is only about 2.3 miles). The trail does cross a large wash multiples times. 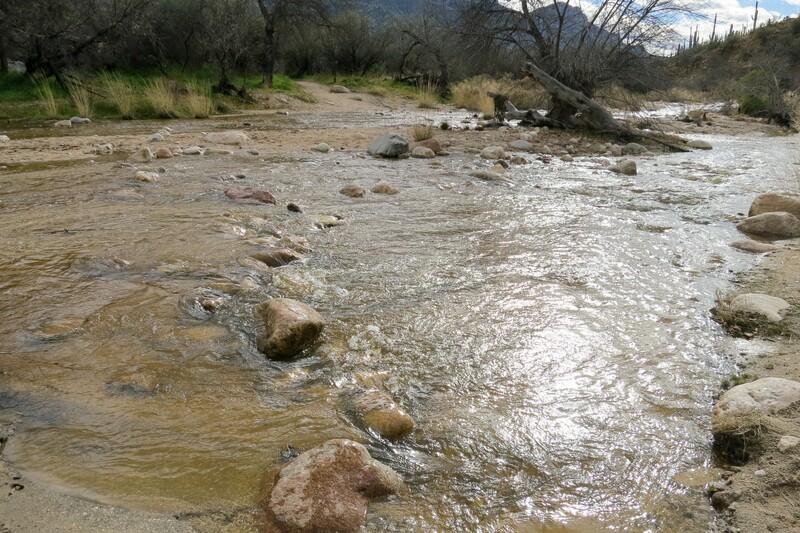 The first time we walked the trail, there was some water flowing through the wash which required stone-stepping to cross each time. The second time we walked the trail, Tucson had received a full day of rain therefore the water was a lot higher. I made it across the first crossing with dry feet. The second crossing I lost my footing and got slightly soggy feet. At the third crossing, all the stepping-stones in the middle of the creek were submerged. Since we were past the halfway point, I just shrugged and got my feet wet (even more). Of course Opie loved each water crossing and didn’t bother using any rocks. The last crossing is through a very large sandy (no rocks) wash area. There was no avoiding the water here. This time the water made it to my calves and gleefully filled up my socks and shoes. Unfortunately for Opie, that was the last time we walked that trail! We also took a stroll up the 50-year trail which follows a ridgetop for a few miles. We got a nice view of the campgrounds from the trail and saw a lot of the AZ vegetation here. We had to be extra careful that Opie lifted his leg high enough whenever he decided to pee on a sharp plant! The Bridle Trail took us right by the equestrian center. While Opie barked his excitement at the horses he saw, they just gave him the stink eye and watched him pass. We even met some other dog lovers while outside with Opie. They have a cute little chow-mix named Pepper and they’ve been full-timing since October. It was nice to meet new people and hopefully we’ll see them on the road again. Taking a break on the 50-year trail. Due to El Nino, we did get a fair bit of rain (and a little bit of snow) while at Catalina… last year we never saw a drop. Unfortunately that meant our campsite became quite flooded. 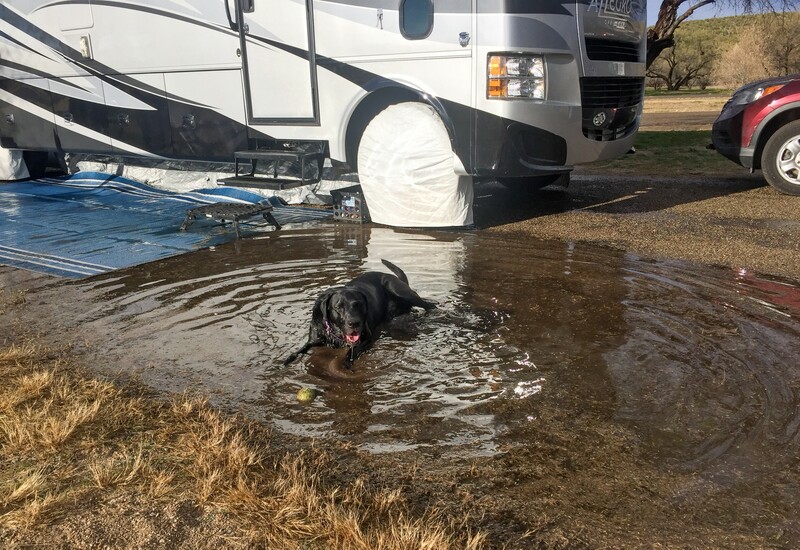 While I got soggy socks and grumbled, Opie looked at the brighter side of things and enjoyed soaking in his private pool until we moved to a drier campsite. Our 11 day stop in Catalina went by way too quickly so Mike promised the next time we’re here, he’ll just make the maximum 14 day reservation to give all of us even more time to enjoy the area (and Opie to guilt me into more hikes). 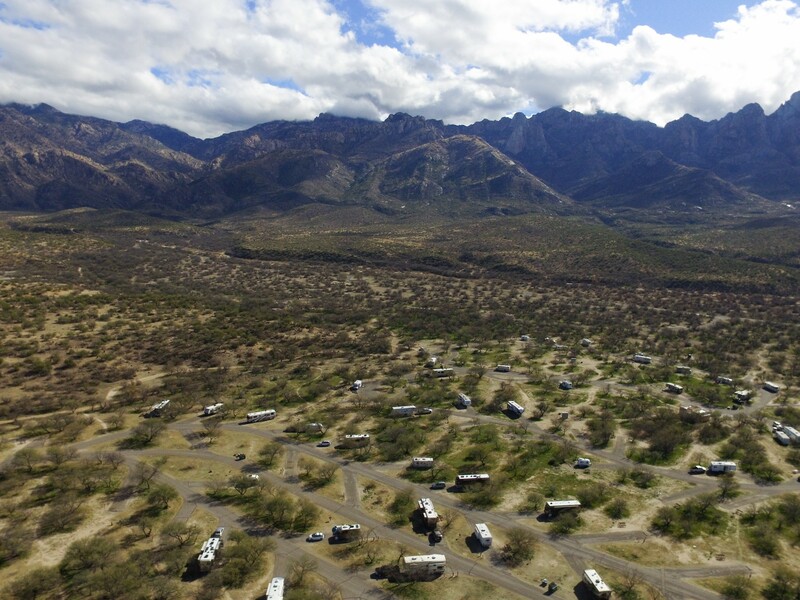 A drone’s-eye view of the campground. You do realize it is all about Opie! We have two dogs, one a 50 lb border collie mix and the other a 30 lb Golden Retriever mix who we think is part Chow and swims in our pool almost every day. We plan on full timing later this year and I’m afraid I will need a blow up pool for her. Perhaps we will cross paths some day and the three of them can play. Enjoy your blog – it’s motivating me to move as fast as I can with preparations for getting out of this time consuming house! We’ve often thought about getting a small plastic kiddy pool to bring with us since Opie loves the water so much so I completely get it! Course for us it would just mean our coach smells like wet dog all the time. 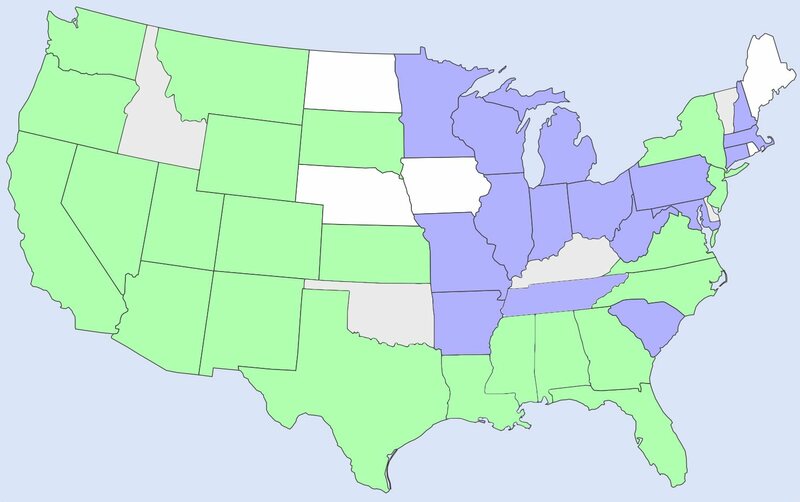 I hope your preparations are moving forward! Still leaning towards the 36LA or a different model? We still love our floor plan. I certainly hope we do run into each other in the future. We love meeting new people and I’m such a sucker for meeting new dogs! Pepper misses Opie. She really enjoyed trying to get him to play with her. We are hoping our paths will cross again. We would love to meet up again, I really enjoyed our time! I miss Pepper…unfortunately I don’t think Opie feels the same.